You must make reservations at least 5 minutes in advance of the time at Zin Bistro Americana. We offer complimentary valet at lunch. There is ample valet and self parking available at dinner. Just as the Zinfandel grape is uniquely American, Zin Bistro Americana offers a menu that reflects the nostalgic cuisine and synergistic blending of cultures that makes America unique. Zin Bistro Americana features a scenic fire lit patio, spacious bar, lounge and lakefront dining where you can relax in a plush setting, have a drink, an appetizer or enjoy the whole gastronomique experience. 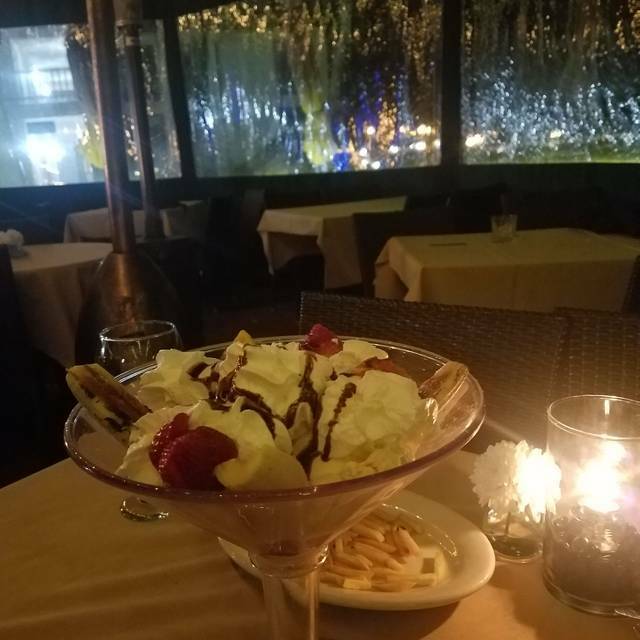 We invite you to savor this experience with us here on the lake in Westlake Village. I made my reservation thru Open Table and received reminder etc. When we got there they were not ready for us and sat us in bar area with water for 20 minutes. We were waiting for outdoor table with view of lake but I finally told them we’d eat inside. My friends were disappointed and I noticed mosquitoes inside the window beside our table. The waiter did his best but overall the food was dry and I just apologized to our friends and told them next time we’d eat somewhere else. Beautiful view, wonderful place for a leisurely lunch with friends. Loved the Fish& Chips. Enjoyed the evening with my husband and son. Great place to have a dinner with friends or with someone special. The noise level is very high, especially inside when the band is playing. I believe this is on Friday and Saturday night - I am guessing. The outdoor patio is fantastic during the summer. On our last dinner we had an especially great waitress named Jamie. You will be in luck if you happened to get her table. I also highly recommend the seviche. We have had it multiple times and it is the best anywhere. I've been there for brunch a couple times and was excited about meeting some friends who had never been to Zin. Unfortunately it was a Saturday night and it was too noisy to enjoy any conversation. There was nowhere to escape to except the porch and it was too chilly. The band was pervasive, too loud for a wonderful dining experience. Maybe they should have a separate room for the bar (good crowd there) and the band. IT WAS LOVELY TO ENJOY A LEISURELY LUNCH WITH A MAGNIFICENT UNOBSTRUCTED VIEW OF THE LAKE AND SURROUNDING AREA. IT WAS A BEAUTIFUL DAY AND A PLEASURE TO SHARE WITH MY YOUNG GRANDDAUGHTER WHO WAS VISITING ME FROM THE EAST COAST. AS A FORMER RESIDENT OF THE AREA , IT WAS FUN TO REVISIT THE LANDING. not cold enough even though I requested ice cold they were luke warm. We found the restsurant cold and drafty, even after moving tables. Our soup was too salty, both main entries were dried out( over cooked) and the ice cream for desert frozen. The waiter was efficient but not particularly friendly or interested in us. It was okay nothing more then that. I will not go back or recommend it to my friends. Best restaurant for Happy Hour in Westlake Village! Love Zin Bistro. My favorite restaurant. Great setting and great food! I love this restaurant , food is always very good as is service . Restaurant really needs some acoustic softening. It was almost impossible to have a conversation with the other 3 people at the table. It was 15 minutes before we were greeted at our table and even longer for a server to ask about cocktails. However, the food service was quick, very good and the meals were served hot! Wine selection is really overpriced though. The Halibut and the Chicken Cordon Bleu were stand out entrees compared to the calamari appetizer which was not good. It tasted tired, rubbery and freezer burned. The Death by Chocolate dessert was outstanding. Overall experience was a 7/10. Probably won't be on my list to return. Venue and ambiance is great. The menu needs to be updated, and also, Zin Bistro has only one vegetarian plate, which has not changed in at least a year. They can do better. This was the end to our non- profits Annual board meeting. My only complaint is I asked to be seated by the window and we were seated in the side room far away from the magnificent view. I had reserved for this party of eight well and it advance. The restaurant was not that crowded there was no reason not to meet the request. Although they boast a Happy Hour 3-7.. unless you ask they don't provide you with the HH menu and pricing. Still excellent after recent refurbishment. Gas heaters on patio if it gets chilly. We knew portions were large so the four of us asked to share everything. This was no problem at all with the helpful servers, and also kept the cost down, as the bill can mount up here. There was live music Saturday night and it can get rather noisy if you're too close. The food is high quality, and this a classy venue on the lake. Went for new years eve, great food and awesome service despite the whole place being crazy packed. Food came out in a timely manner, entertainment was fun, and midnight drinks and props were great. Booked a reservation for mine & my bf’s anniversary on NYE. Made it for 7 then had to have it pushed back to 7:15 & they accommodated. When we arrived the hostess tried to seat us outside on the deck overlooking the lake which otherwise would’ve been nice except that it was really cold and windy so we asked for a table inside which we had to wait only a few minutes for. The waitress was super friendly & was on her game given the amount of tables she was overseeing, I believe her name was Sara. For drinks the boyfriend had a Tennessee Mule which was really good. I had the Cucumber Crush I believe it was & then the Ruby Red Margarita. Both were refreshing & they all arrived in a timely manner. Our desert of the night ended up being one of their after dinner cocktails, we chose the Zins Latte I think which was my fav. The food was perfect & arrived in a good amount of time. We had the yellowtail appetizer which was really amazing & fresh, the sauce on that was insane. The boyfriend ordered the well known shrimp scampi & he was pleased, & I ordered per our waitress’ recommendation the wasabi ahi tuna entree which was to die for & will be back for that alone. We wanted to have the table side banana flambé thing they do but they didn’t have it available for NYE, we will be back for that. The ambiance of the place is really swanky & nice. The entire restaurant is very clean, including the bathrooms. The decor is tasteful & modern. It was a little loud for us this time but of course it was New Years Eve so they had a party & it was busier than normal. 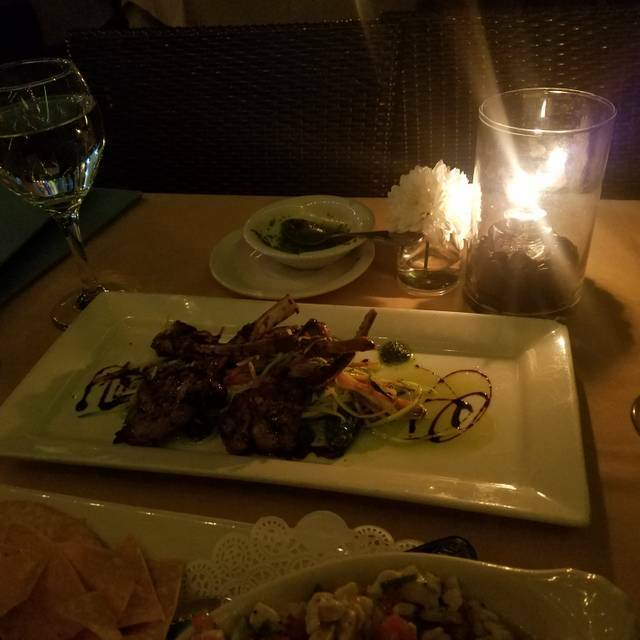 This place is a little pricier than your average restaurant but is worth it for the quality of food and service, the location- being that it’s right on Westlake Lake, and the overall experience. They did have a special menu for NYE but the waitress did let me know most of the items on their were house regulars which is nice. They also didn’t charge a ticket or plate fee like a lot of places do on NYE. I have dined here many times, either to meet a friend (who lives in Pasadena and I live in Santa Barbara) for lunch or for lunch or dinner on my way home from LA or further south. Great menu, outstanding food, friendly and attentive service, wonderful view. I am so sad to say, this place was our favorite place to celebrate birthdays, Christmas, etc.. I love this place for it's ambiance, the food used to be very good. Unfortunately, The food quality has gone down, every time it seems as if it is getting worst. We ordered NY steak, had to return the food 2x it was over cooked, well done. It took almost an hour for the food to be served. I have to say they were very nice about it, tried to change the steak, but you can't even eat it. I promised my kids this will be the last time we will be going there. Beautiful restaurant situated by a man-made lake. The service and food were excellent. We sat outside so noise wasn't an issue and we were able to have a conversation without yelling. A bit pricey but worth it. Noise level very high.. Both my husband’s entre and mine were over cooked— cordon bleu and crusted halibut! We have typically enjoyed this restaurant by the lake and were disappointed this time but we will go back and give it another try. We were there on a Thursday night and it was very rowdy due the Chargers Football Game . There was live music , and I felt so sorry for the singer that had a great voice, as the rowdy, drunk football fans were so loud , you couldn't hear the music or conversation with our party of 2. If there is live music, for goodness sake , turn the football game off. It was not the Super bowl, nor is Zins a " sports bar. Very disappointed that our quiet dinner was ruined by excessive noise. 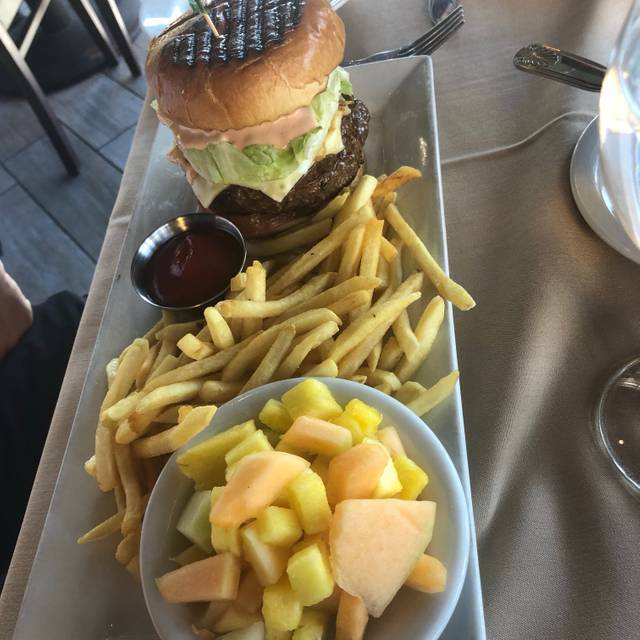 The food was delicious as always, and the Service was excellent. My husband and love this restaurant! My girlfriends love to come here because we know we will get excellent service and great food. It is the perfect setting for a romantic dinner, or a casual lunch. We expect to continue having our romantic evenings and group gatherings for a very long time! It is the perfect setting for anytime of the year. The food was excellent (roasted seafood, scallops, lobster mac can't compare them as to inside dining. Beautiful atmosphere, service was good, food was good not exceptional. We were a group of 3 women so we appreciated not being rushed on a Saturday afternoon. I have been to Zin Bistro before and found it to be good. My mistake was going to Zin Bistro for Thanksgiving. Rather than their regular menu, they provided a buffet. The variety was limited and the quality was poor on nearly everything. The turkey was good, but everything else we tried was poor. They charged $65 per person. I feel the value for the price was very poor. I feel taken advantage of. The selection was so limited and the quality so poor, that my daughter ended up having a small piece of salmon and 1 chicken tender for $65. My other daughter had 1/2 a serving of salad (she didnt finish because it was poor) and 1/4 bowl of tomato soup (she didnt finish because it was also poor). Further, we had a 5:45pm reservation. To my surprise, they started cleaning up the buffet before we were finished. Had I wanted to go back for additional turkey, I would not have been able to. All around a poor choice by us. We were very disappointed. We spent $260 plus tax and tip for a limited and mediocre dinner. 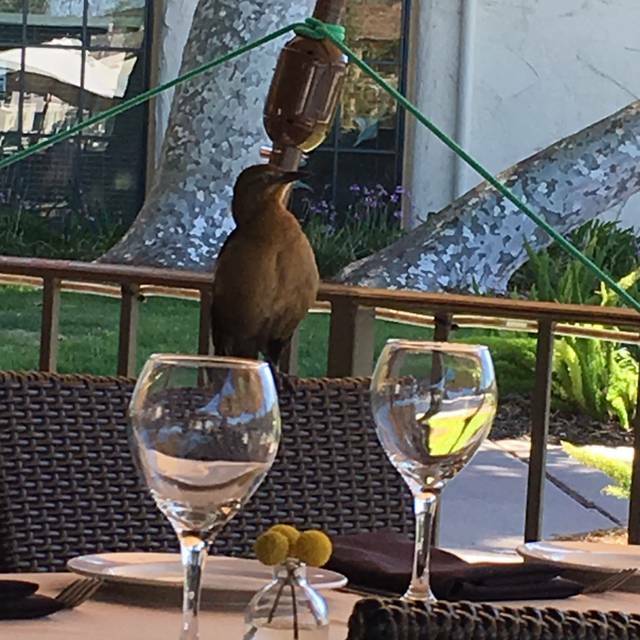 This is not consistent with prior experiences at Zin Bistro. A very expensive and disappointing Thanksgiving meal. Usually a good place but the halibut I had this time was dry and the crust was burnt. Disappointing experience.